This is Aisha Seqqat, the sister of Annaya above (women keep their maiden names), and also one of the "women leaders" in N'kob. The village selects two women leaders, and they get a special training to mobilize and work with women as part of the village's development program. 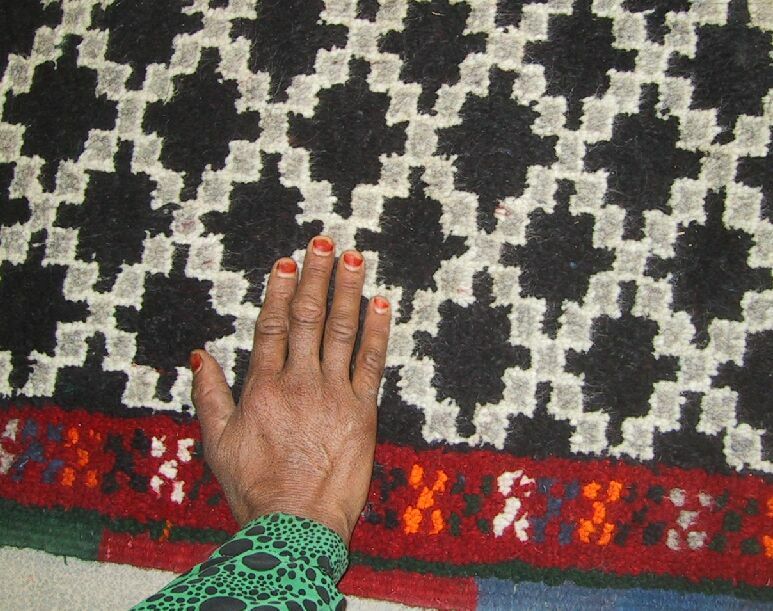 When I arrived to photograph rugs, Aisha helped inform the local women. She also has a lively sense of humor (which I'm afaid the photo didn't catch) and kept me laughing all day. 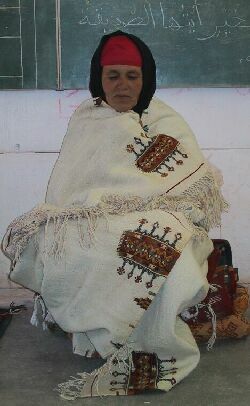 Aicha is married and her husband works with rugs for several weavers. They have seven children, four sons and three daughters. Two daughters help her weave and she supervises; she's been weaving for 25 years. 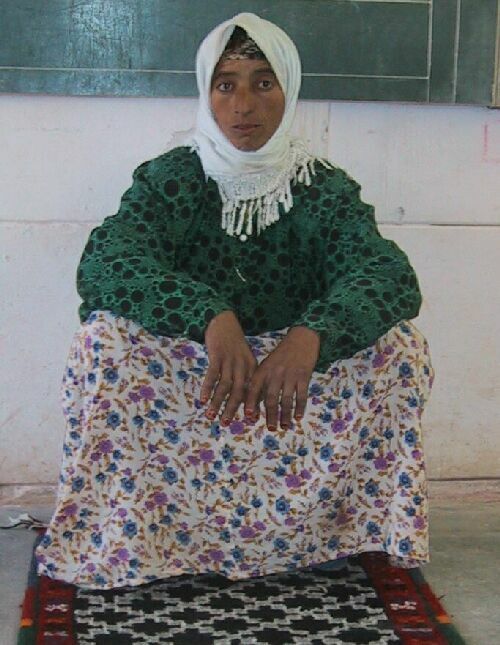 She uses her earnings for household needs like flour, tea oil and sugar. Recently she has also used her money to travel, which usually means visiting married daughters in Marrakesh and Agadir. The daughters like to buy clothes with their share. Here Aisha is wearing a woman's wrap or "tahaikt" in Berber, "haik" in Arabic, which you can see better by clicking on the photo. 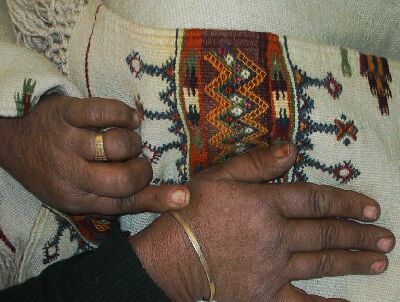 Further on you will see one of her daughters with a "tahaikt" like this that she has woven, and she will weave them to order. Here you can see the richly-colored designs, especially if you click on the photo. You also notice that Aicha is pointing to a small scab on her hand. That's where she got pricked when she was out collecting plants to use for the natural dyes she makes, some of which you see on the fabric here. She went through a long list of dye sources: orange comes from apple roots, purple-red from "tarrubiya" or the root of a plant we call madder, and green from a flower they call "ooshfood". It's the last one that has the thorns that caused her sore. For blue she uses a dye called "nilj" that she buys. I've been told that has the same chemical composition as natural indigo. This is the ooshfood that is used to make natural yellow dye. When I visited N'kob in March 2004 an Italian television crew filmed Aicha using it to dye yarn. You can really see the thorns at the upper right when you click on the photo. 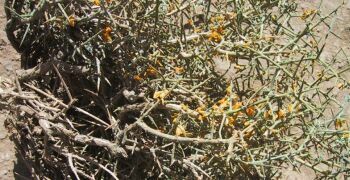 The women remove the yellow flowers for the dye, and have to work around the thorns. This is Fadma Ahouli, and she just made the rug below. She's still single and lives with her father. When she earns money for a rug she gives it to him, and asked him how much she should charge for the rug here. It is fairly typical for the men to know about, and handle, the marketing instead of women. Piece 2.11386 is a small knotted rug with a gray and white lattice on a black background with a rich red border. You can see the details best on the close up. The size is about 2 x 4 feet and it costs $135. It is SOLD but can be redone.